At the termination of Medicare coverage, the cost of long-term care falls on the person requiring skilled nursing facility services. The average private pay rate for a skilled nursing facility in the State of California is $6,311.00 per month (2010). This rate may be significantly higher where the skilled nursing unit is part of an acute medical hospital. (4) Motor Vehicle: You can own one motor vehicle as exempt whether you still drive or not as long as the vehicle can be used to meet your transportation needs (shopping, visits, medical appointments, etc.). There is no limit on the value of the vehicle. You cannot exempt an recreational or commercial vehicle if you have any other type of vehicle. (a) Individual Retirement Accounts (IRAs): The one area where unavailability is beneficial both for qualifying and for later protection against a death claim for benefit recovery is work-related retirement plans owned by the institutionalized person. As stated earlier, IRAs, 401K accounts, Deferred Retirement Compensation Plans and other retirement type of accounts belonging to the non-institutionalized spouse are fully exempt. Unfortunately, those same accounts belonging to the institutionalized spouse are not considered as exempt. If the accounts are paying out periodic payments of both income and principal, the retirement accounts belonging to the institutionalized spouse will be considered unavailable and the principal amount held in the account(s) will not be included in the non-exempt resource valuation. If not paying out periodic payments of principal and interest, the institutionalized spouse’s retirement accounts will be considered available non-exempt resources. When a person reaches age 70 2, s/he should begin making minimum distributions from the retirement accounts. This minimum distribution is considered a periodic payment of principal and income even if only made once each year. Persons under the age of 70 2 can also receive periodic payments of principal and income but such action should not be taken without first consulting with your accountant and/or attorney. (a) Ownership and Transfer of Asset Penalties: The issue of ownership is often confusing and may create unexpected problems. In the case of a single Medi-Cal applicant, issues of ownership normally involve assets held in joint tenancy with a child or loved one. First, ownership in joint tenancy must be equal. If you place a child on title to real property in joint tenancy, you each own a one-half interest in that property. Second, placing a person on title to your asset(s) normally constitutes a transfer or gift of an interest in that asset and may subject you to a period of ineligibility if the transfer occurs within thirty (30) months of your Medi-Cal application (soon to be sixty (60) months). Unfortunately, placing another person on your asset(s) does not always constitute a gift and/or a reduction in your total assets. Normally, where both spouses are either both living outside of a skilled nursing facility or both living in a skilled nursing facility, the couple is considered to be living together. If a married couple apply for Medi-Cal while living together, both partners will receive benefits. A married couple living together will qualify for and remain eligible to receive Medi-Cal benefits when the couple’s total non-exempt assets does not exceed $3,000.00 on the last of the month. If one spouse of a married couple is in a skilled nursing facility (Institutionalized Spouse) while the other is not (Community Spouse), the Institutionalized Spouse will become eligible for Medi-Cal benefits when the couple’s total non-exempt assets do not exceed $113,640.00 (2012) on the last day of the month of application. Thereafter, the Community Spouse may acquire assets in excess of $113,640.00 while the Institutionalized Spouse remains eligible for Medi-Cal benefits in the skilled nursing facility. Ninety (90) days after qualifying for Medi-Cal benefits, the Institutionalized Spouse’s name cannot appear on non-exempt assets totaling more than $2,000.00 on the last day of the month. Henry (H) and Wanda (W) are married. H was placed in a skilled nursing facility last month and has just qualified for Medi-Cal long-term care benefits. After all allowable deductions for H’s Medicare premium, his personal needs allowance ($35.00), and H’s Medicare supplemental insurance premium, the couple receives a total monthly income of $4,000.00. Of this total, H receives $3,000.00 per month in Social Security and Pension benefits while W receives $1,000.00 from her Railroad Retirement. Since W has the option of retaining $2,841.00 per month from all income received in both spouse’s names or all the income received in W’s name alone, whichever is greater, W will select the guaranteed $2,841.00 as her minimum monthly needs allowance (MMMNA). If, however, W is the institutionalized spouse and H is the Community Spouse, H will select all of the income that comes in H’s name alone since that income ($3,000.00) is greater than the guaranteed $2,841.00 alternative. The above-described system continues until the Medi-Cal recipient recovers, becomes ineligible or dies. If a person recovers or becomes ineligible for Medi-Cal, Medi-Cal, in contrast to common belief, does not attempt to recover the benefits paid during the recipient’s life. As a starting point, Medi-Cal can only recover for those benefits paid to or for an individual who was over age 55. Any benefits paid to or for that person prior to reaching age 55 are not recoverable. Further, recovery is limited to the amount of benefits paid (after age 55) or the value of the deceased Medi-Cal recipient’s “Estate,” whichever is less. To better understand recovery, let’s look first examine the Medi-Cal Recovery System as it relates to a single Medi-Cal recipient. John dies, passing his Estate to his son, Fred, under his Will. Under California Probate Code ‘215, Fred must notify the Department of Health Services (DHS) of John’s death. The notification required involves sending a copy of John’s death certificate to the Director of DHS in Sacramento, California. Merely informing the local County Welfare worker of John’s death is not sufficient and does not constitute formal notice. (a) House: Although the house was held in joint tenancy with Fred and is not part of John’s probate estate, the State of California will include John’s one-half (2) interest in the house in John’s Estate for recovery purposes. This is due to California’s 1993 expanded definition of “Estate” which includes everything in which John had any legal title or interest at the time of John’s death including all assets passing by joint tenancy, tenancy in common, by survivorship, by life estate, in a living trust or any other similar arrangement. Since the house is worth $100,000.00 at John’s death and John owned a one-half (2) interest in the house, the State can assert a $50,000.00 claim against the house. The value of John’s Estate for recovery purposes is $58,500.00 ($50,000.00 interest in house, $7,000.00 interest in the vehicle and $1,500.00 interest in the checking account). The State has paid $75,000.00 for John’s care. As the State’s claim is greater than the recoverable value of John’s Estate, Fred will pay the State $58,000.00. The State will release the unpaid remainder. Fred is not liable for the difference. If, on the other hand, John’s recoverable estate was greater than the State’s claim, Fred would pay the State claim and the remainder would go to John’s heirs under his Will. As should be clear from the above, the use of a living trust, joint tenancy or similar arrangements does not protect the assets of a single Medi-Cal recipient from State recovery at the death of the recipient. The State is prohibited from recovery, however, when the Medi-Cal recipient leaves a minor, blind or disabled child even if that child is not a beneficiary of the Medi-Cal recipient’s assets. The State may also be prevented from recovery where such an action would cause a hardship. Unfortunately, the definition of or criteria to establish a hardship has not been developed by the State and hardship waivers are few and far between. (2) Recovery Against a Married Person’s Estate: While recovery against the Estate of a single Medi-Cal recipient is fairly straightforward, the same cannot be said for recovery against the Estate of a married Medi-Cal recipient. The matter of recovery at the death of a spouse who has received Medi-Cal benefits is, at best, unsettled. To better understand the current state of recovery of assets belonging to a deceased married Medi-Cal recipient, it is helpful to review the manner in which recovery was made in the relatively recent past. To simplify the matter, let’s examine Herman (H) and Wanda (W). At H’s death, W notified the local Medi-Cal case worker by phone and sent a copy of H’s death certificate to the Department of Health Services (DHS) in Sacramento as required by law. A few weeks later, W received a letter from DHS claiming that the State had spent $100,000.00 on H’s care. Included with the letter was a simple form requesting information concerning the assets owned by H at his death including all of those assets held in joint tenancy. W replied to the request for information and waited for a response. At the death of a spouse who had received Medi-Cal benefits at any time after reaching age 55, the Department of Health Services must be notified. The Department may then (and does) inquire into the assets belonging to the deceased spouse at his/her death. Thereafter, the Department must defer recovery until the death of the second spouse. Further, the recovery at the second spouse’s death is restricted only to those assets that passed to the surviving spouse from the deceased Medi-Cal recipient spouse. Although the Department now utilizes this new approach, there remain many unanswered questions. For example, if H left W his interest in the house and W later sold the house, is the State entitled to the proceeds from the sale at W’s death or only a share of the house? What if W invested the proceeds in Internet stock and increased the value of the proceeds, is the State entitled to share in the appreciation? On the other hand, what if W invested her money and lost all of the sales proceeds, is the State entitled to seek other funds belonging to W at her death? 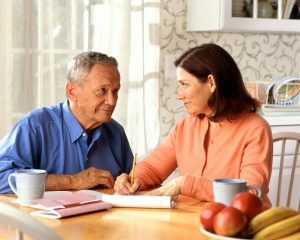 As you can see, there are still many unsettled issues involving recovery against a deceased spouse who received Medi-Cal benefits subsequent to reaching age 55. And, as in the past, recovery is easily avoided by taking action during a recipient’s lifetime. As should be obvious from the above discussion, Long Term Care Planning for Medi-Cal eligibility is highly technical and complex. If done improperly, it can result not only in ineligibility and/or recovery, but can have adverse tax and estate consequences as well. For this reason, consultation with a qualified attorney specializing in Long Term Care Planning is money well spent.